Welcome to the heart of the Epic Armageddon scene in London! Epic Armageddon is a wonderful game in which huge titans face off against vast swarms of infantry. 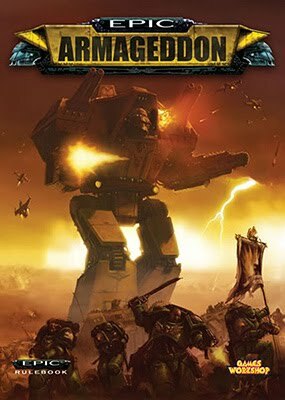 If you've ever played Warhammer 40k and wanted more, read a sci-fi novel and longed to recreate an epic battle or simply wanted to come play a fun game with a bunch of enthusiastic friendly folk (over a beer of course) then Epic Armageddon is for you. Simple to learn, difficult to master the scene has grown substantially in London over the last few years. There are more than 30 different armies available from hordes of guardsmen, odds defying space marines, and sneaky Eldar to vast titan legions, swarms of Tyranids and swift Tau. Heck, even the Squats are back from near extinction. There are several clubs in London playing on a weekly basis. Games range from friendly matches and intro games for new players to official and unofficial tournaments, an annual London derby between the clubs and a North London club league. All these events are available to everyone from grizzled Commissar Yarrick type veterans and initiate Chaos Cultists anyone can join in. Of course, we all started somewhere so are happy to play intro games, talk you through the rules, and lend you armies to try. So take a nosy round the site to find out a bit more or, to get in touch with an actual human drop us an email to find out more. Games Workshop, the Games Workshop logo, Epic, Battlefleet Gothic, the Battlefleet Gothic logo, Specialist Games, the Specialist Games logo, Forgeworld, and all associated marks, names, races, race insignia, characters, vehicles, locations, units, and their mothers from the Warhammer 40,000 universe and the Warhammer World are either ®, TM and/or © Copyright Games Workshop Ltd 2000-2015, variably registered in the UK and other countries around the world. Used without permission. No challenge to their status intended. All Rights reserved to their respective owners.